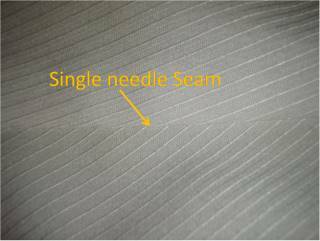 Why are single needle seams superior to double? Single needle seams are sewn along one side, then on the reverse by the same needle. 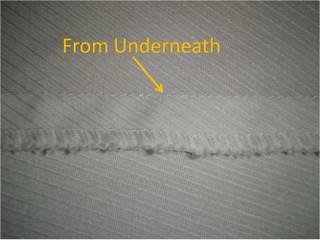 It is equally stitched twice but with a flat felled hem, hiding one row inside the fabric. From outside, you see only one neat row, but two rows from the underside. The main advantages are durability, a smooth finish and comfort to the skin even after repeated laundering. 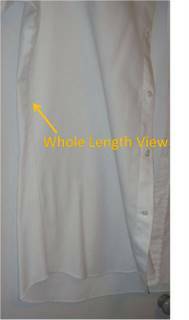 This is due to the lock stitch used by Master Tailors and Seamstress. More information can be found here. Look at the inside leg stitchings on a pair of Levis. That is a twin needle. Both fabric edges are folded over and then a twin needle machine, utilizing a chain stitch goes over the lot. Do you feel the roughness of the underside? That is where the thread forms a loop. The appeal of a single stitch is that it makes the joint stronger by running two lines of stitches through each piece of fabric, while simultaneously encapsulating the raw edges and preventing them from unraveling. What's more, it's pretty simple once you get the concept. Flip the bottom piece out from underneath so that both are lying flat on the table and the extra flap sticks up in the air. Fold the longer flap down over the short one and then fold both of them down flat, as shown. 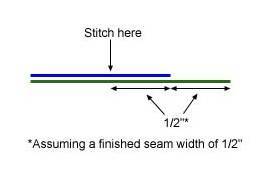 Sew a line of stitches to hold down the flap. When you sew this second row of stitches, be sure to gently pull the two pieces of fabric taut and press the overlap flat as you feed it through the sewing machine. This will result in a cleaner and stronger seam. Only the second line of stitches will be visible from the outside. This gives the dress shirt a cleaner look.